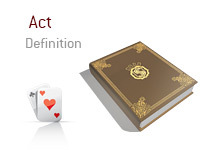 What does the term "act" mean in poker? What is the definition of the term "act"? When a poker player needs to "act", this means that it is their time to make a decision in a hand. This includes folding, calling or raising. For instance - if somebody is "next to act", this means that it is their turn to make a move. Let's say that somebody has raised from early position, and the "action" is now on the player on the button. In this situation, the player on the button can "act" by either folding, calling or re-raising the original raiser. If somebody is "last to act", this means that they have the last action in the hand. This is a powerful position to be in, as they can see how everybody else has acted in front of them.